Our commitment to excellence means we stand behind every job we do. Take our client's words for it! "I had them out last fall to replace my gutters. Their strong hanger held up to the cold Michigan winter! Thanks for the great value Richard!" "Very pleased with the entire process from quote to timeliness, materials, workmanship, clean up and value. Richard is a pleasure to work with and his crews are very professional and efficient. Great Choice!" "Best service in the area and price! Super professional!" "Best service! I 100% recommend this service. Professional job for a good price, and with high-quality materials. Highly recommended." "We booked our job with Richard in late October, letting him know we needed to paint first. Winter set in fast, before we could paint. Richard called us in the spring and accommodated our ever-changing schedules, including delays due to painters, weather and our out-of-town travel. The crew showed up on time, worked efficiently, and gave us a great value and product. We definitely recommend using this company." "Great job! I am on a budget and these guys beat out 2 other local contractors with their estimate. They showed up on time for the job and finished in about 3 hours. I am very happy with the job and my choice to use discount seamless gutters. 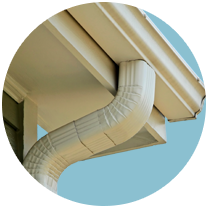 I highly recommend them to anyone looking for gutters." "Just had a job completed by these folks and I am well pleased with work that was done and the people who I worked with. Richard K arrived on time for estimate appointment was quick and professional and gave me a detailed quote sheet describing work to be done and price. My house is nearly 100 years old and besides new gutters I wanted new fascia board installed and aluminized and vinyl covering on the soffit (overhang). The leader of the crew that did this work was very informative about what he was going to do, and we discovered that a small section of the sub-roof was damaged and covered over by the previous homeowner he quickly quoted me a price for the extra work and did a great job. This crew worked in some pretty cold and nasty weather in November to get the siding job done before the heavy winter weather set in. The entire job is also about 25 feet up. As soon as the weather broke the gutter crew came out and was done in a day. My house looks great - the best it has since I bought it. Thank you for a super job!" "My experience was great. Price was cheaper than most. I don’t know how many installers they have, but make sure to ask for Dave. He was very professional and took time to answer all my questions, and made sure everything was done the way I wanted it. He even trimmed tree limbs from my roof for free. Would rate them 10 stars if I could!" "I’m on a fixed income just needed some repairs Richard came out and quoted me for $125 upon further review Dave noticed a couple other repairs. He did those at no extra charge I hope you see this thank you Dave!!"